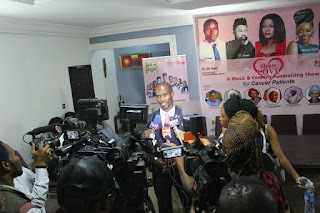 Project PINK BLUE- Health & Psychological Trust Centre to raise N100million to support the treatment of indigent cancer patients in Nigeria at a fundraising event titled Show Love a Music & Comedy Fundraising Show for Cancer Patients that would take place on Thursday 15th November, 2018, 6pm at Congress Hall, Transcorp Hilton Abuja. Show Love is our new fundraising programme focused on encouraging and engaging Nigerians to financially support indigent people impacted by cancer. We can create awareness, provide screenings, oncology education, but, if we dont provide financial support to cancer patients for treatment, then our circle of care is not complete and very few lives can be saved. Financing cancer treatment is very expensive and not affordable for millions of Nigerians. Hence, financial support to indigent cancer patients is extremely important to their survival. In 2015, a 35 year old lady with stage II breast cancer came to us for financial support for her breast cancer treatment, she needed N15million for the treatment of HER2 positive breast cancer. This breast cancer according to doctors is a very aggressive cancer, however, she needed a targeted therapy to treat the breast cancer after her single mastectomy (that is, removal of one breast). Project PINK BLUE started the fundraising to save this young ladys life, but, it took us a year to raise the N15million in 2016, as at this time, her cancer has progressed from stage II to stage III- the breast cancer has spread from the breast to her lungs and brain. In this case, you can clearly see that she diagnosed her breast cancer early, but, because of funds she could not get treatment early. Our new programme is focused on raising funds and hosting of a trust to support cancer patients and not to wait till the patients come and we start fundraising which may take more time. Early detection saves lives, however, we must also add that early detection and early treatment save lives, because, sometimes people are diagnosed of cancer very early, but, they cannot afford the treatment. This becomes a serious challenge to their survival. According to a report on Catastrophic Health Fund for Oncology Care, in Nigeria, a woman needs about N2.1million to N29.2million to treatment breast cancer depending on the type of breast cancer. Because the woman may need about 8 series of diagnosis which may cost between N232,000 to N311,000; she would also need about 3 surgeries which would cost her N670,000 to N3.3million; she would also need chemotherapy for over 10 sessions which may cost about N916,000 to N2.6million depending on the breast cancer and finally, she may also require radiotherapy for 10- 23 sessions, which may cost N138,000 to N360,000. Thats for breast cancer treatment in Nigeria. For cervical cancer treatment in Nigeria, a woman needs about N1.1million to N3.3million to treat cancer of the cervix. While for prostate cancer, a man needs about N1.3million to N4.5million to treat cancer of the prostate. With a weak national insurance scheme, very few Nigerians can afford to pay for their cancer treatment in Nigeria. This is one of the reasons for a diagnosis of cancer being likened to be a death sentence. Indigent cancer patients needs our support. Please donate to save cancer patients in Nigeria. In Nigeria, cancer is increasingly recognized as a critical health problem in Nigeria. More people are dying of preventable cancer death. According to the 2018 World Health Organization (WHO)/Globocan report, they are 115,950 new cases of cancer annually in Nigeria and 70,327 cancer deaths annually. It was reported that breast cancer is the leading cause of cancer death in Nigeria with 26,310 cases (22.7%), followed by cervical cancer with new cases of 14,943 (12.9%) and prostate cancer being the third leading cause of death with 13,078 (11.3%) new cases annually. Other leading cancers are colorectal cancer, liver cancer, non-hodgkin lymphoma, stomach, pancreas, ovary and leukaemia. Painfully, the rising cost of cancer treatment and poverty has been a major impediment for several cancer patients to afford cancer treatment in Nigeria. On 13th April, 2018, the Federal Government of Nigeria launched her National Cancer Control Plan (2018-2022) through her Federal Ministry of Health. The plan defined a comprehensive strategy on cancer control and provided a clear road map on how the Nigeria government will undertake cancer control efforts in the country in the next five years. One of the priorities of the plan is to scale-up survivorship since, we are losing our women, men and children to this disease. The plan also stipulates that Nigeria require $308million to reduce the burden of cancer in Nigeria for the next five years. Clearly, with the competing priorities in healthcare and other government sectors, the government needs support to achieve this target to reducing the burden of cancer in Nigeria. It is on this premise, that Project PINK BLUE is hosting this Show Love- Music & Comedy Fundraising event for cancer patients in Nigeria, to raise N100million. Show Love will take place on Thursday 15th November, 2018, at 6pm, Congress Hall, Transcorp Hilton Abuja. We made it a ticketed event for all to donate: N5,000 & N25,000 for Regular Tickets, N250,000 for VIP Champions table, N500,000 and above for VVIP Honours table. The event will feature the following: Host: Alex Unusual of Big Brother Naija, music: by Chidinma Ekile, comedy by: Osama, Koboko Master, Ambassador Wahala, Ghana Must Go, MC Tagwaye, MC3310, McBob, Mc Ukodo and many others; dance will feature Adogah Moses & friends- Abuja most energetic dance group. We would also auction some Nigeria celebrities and CEOs to raise funds, such as: Bassey Eyo, CEO, Payporte, the sponsors of Big Brother Naija; Annie Idibia, Nollywood Actress; Charles Okpaleke, CEO, PlayNetwork Africa; Rechael Okonkwo, Nollywood Actress; Laura Ikeji, social media influencer & CEO, Laura Ikeji Store; Kemen of Big Brother and many other CEOs. 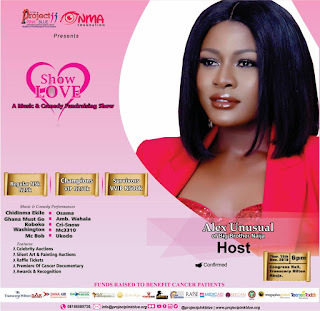 Several organizations and individuals whom have contributed to cancer control in Nigeria will also be recognized at Show Love. H.E. Sen. Atiku Abubakar Bagudu, the Executive Governor of Kebbi State will be the Special Guest of Honour; other special guests are: H.E. Dr. Zainab Shinkafi-Bagudu, Wife of the Executive Governor of Kebbi State, Founder of Medicaid Cancer Foundation, and Board Member, Union for International Cancer Control (UICC); H.E. Betty Anyanwu-Akeredolu, Wife of the Executive Governor of Ondo State & Founder of Breast Cancer Association of Nigeria (BREACN); H.E. DCNS. Omelewa Yetunde Ahmed, Wife of the Executive Governor of Kwara State & Founder of LEAH Foundation; H.E. Dr. Amina Abubakar Bello, Wife of the Executive Governor of Niger State & Founder of Raise Foundation; H.E. 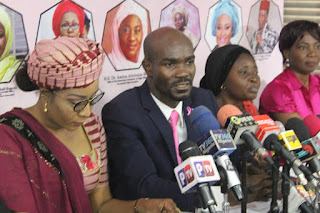 Dr. Rasheedat Yahaya Bello, Wife of the Executive Governor of Kogi State & Founder of Kogi Women and Youth Advancement Foundation (KOWYAF), Chief Moji Makanjuola, Veteran Broadcast Journalist; Chief Chidinma Uwajumogu, Founder of Egobekee Foundation; and many other influential Nigerians and diplomat community. We appeal to all Nigerians to attend the Show Love- Music & Comedy Fundraising Show, as a way to show love and support people battling with cancer in Nigeria. For donations, Health & Psychological Trust Centre, 5600285654, Fidelity Bank Plc. For tickets, please visit: www.eticketsolutions.com or www.projectpinkblue.org/events . Tickets are also available at Drumstix Restaurant Wuse II, Abuja, Niger Delta Restaurant, City Park, Wuse II, Abuja and at Project PINK BLUE Office, 22 Koforidua Street, Zone 2, Wuse, Abuja. You can also call: 08188347020, 08168589720 or 07086908385 for tickets or enquiries. Show Love is an initiative of Project PINK BLUE, supported by Transcorp Hilton Abuja, Daar Communications, Dana Air, PlayNetwork Africa, Abeysteph Global Limited, Bellanaija, Option A, Raise Foundation, Medicaid Cancer Foundation, Superself Fitness, Nma Foundation, Breast Cancer Association of Nigeria (BRECAN), Leah Foundation, Kogi Women and Youth Advancement Foundation (KOWYAF), MegaPlus Global, Teenee Todds, Beltina Press and many other organizations.